The second in the Tales of a New World series picks up only hours after Moon Chosen (2016) left off. 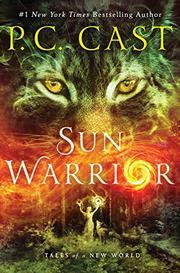 With fire still ravaging the City in the Trees, 23-year-old Nik and 18-year-old Mari, along with a band of wounded canine and human companions, reluctantly agree to flee to the home of Mari’s Earth Walker clan to heal and regroup. What they didn’t expect was that more than their superficial cuts and burns would be mended. Despite centuries of prejudice, hatred, and fear that make it difficult for the two clans to trust one another, they quickly find strength in their differences and vow to unite and build a better, new world together, with Nik and Mari as their guides. Unfortunately, others, namely the leader of the Skin Stealers, have a much darker and more dangerous vision for the future. Though at times a bit heavy-handed, Nik and Mari’s aspiration to build a community founded on the principle of inclusion is both noble and refreshing. The members of this new clan explore their differences and feelings gently and respectfully, and readers will likely enjoy the hints of new romances budding between characters. This bears an unsettling and disturbingly sharp contrast to the Skin Stealer world, which some may find difficult to stomach, particularly with regard to the sexual violence visited on the eyeless, 16-year-old Dove. Though Nik and Mari are pale-skinned, racial categories do not seem to exist in this world.